Among wide receiver combos during the late 80’s-90’s, the AFC Central sported both the Houston Oilers’ in Hill,Givins,Jeffires and Duncan and the Bengals with equally talented- and in some cases superior group of Brown, Holman, and McGee. 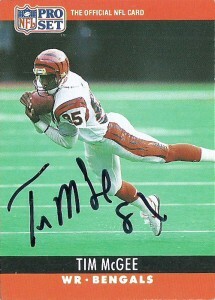 Originally a first round pick of the 1986 draft by Cincinnati out of the University of Tennessee, McGee finished as the college’s all-time leader in yards, receptions, and touchdowns. He’d be immediately paired with 1985 1st round choice Eddie Brown, freeing up Eddie and tight end Rodney Holman across the middle. 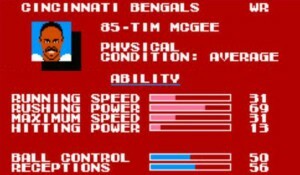 McGee would start initially as the Bengals’ kick returner. He’d finish his rookie season with slightly over 1000 yards returning and an additional 276 receiving. His total yards from scrimmage would be 1283 for 1986. A fearsome long bomb receiving threat, Tim averaged a 17.3 yards in his rookie season. In 1988, he’d average a career high 19.1 yards on 36 receptions, scoring 6 touchdowns. 1989 would be an impressive season for Tim, as he’d help lead the team to the Super Bowl, with 1211 yards receiving and 8 touchdowns. As the team suffered from the dismissal of head coach Sam Wyche and perennial quarterback Boomer Esiason’s departure, McGee’s statistics and starting time would diminish. As free agency rolled around in 1993, McGee would sign and play one season with the Redskins making 500 yards and 3 touchdowns. 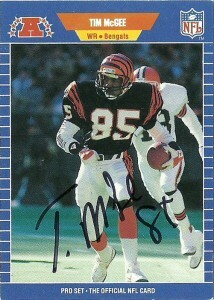 He’d re-sign with the Bengals in 1994 and retire after the 1995 season. McGee is a great through the mail signer confirming this with an 11 day turn around on these 2 cards. He is currently a sports agent in the greater Cincinnati area.